Unit 3 A day out Integrated skills. 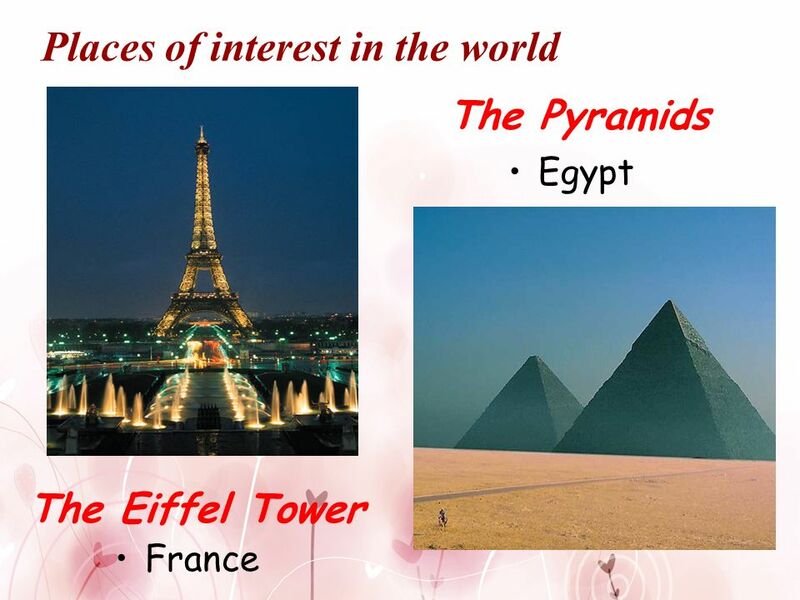 4 Where will it take place? 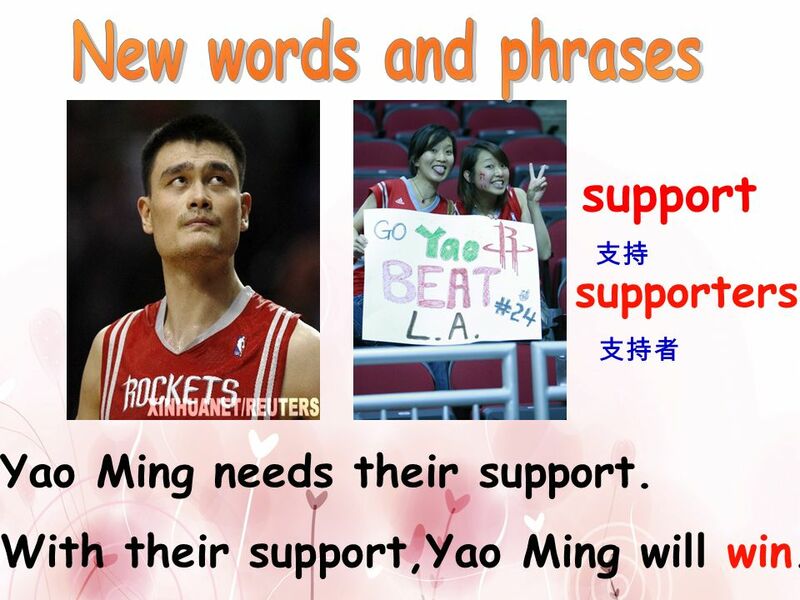 5 support supporters Yao Ming needs their support. 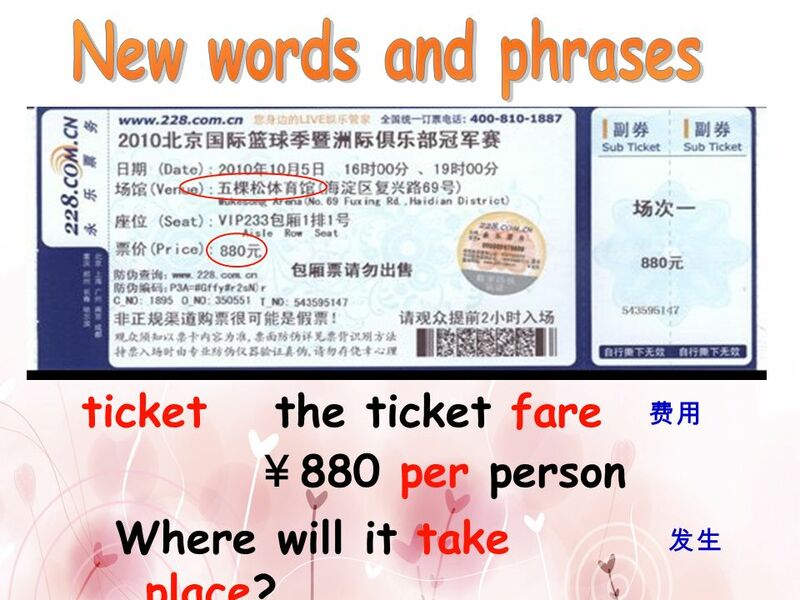 New words and phrases support 支持 supporters 支持者 Yao Ming needs their support. With their support,Yao Ming will win. 欢呼，喝彩 cheer for sb. 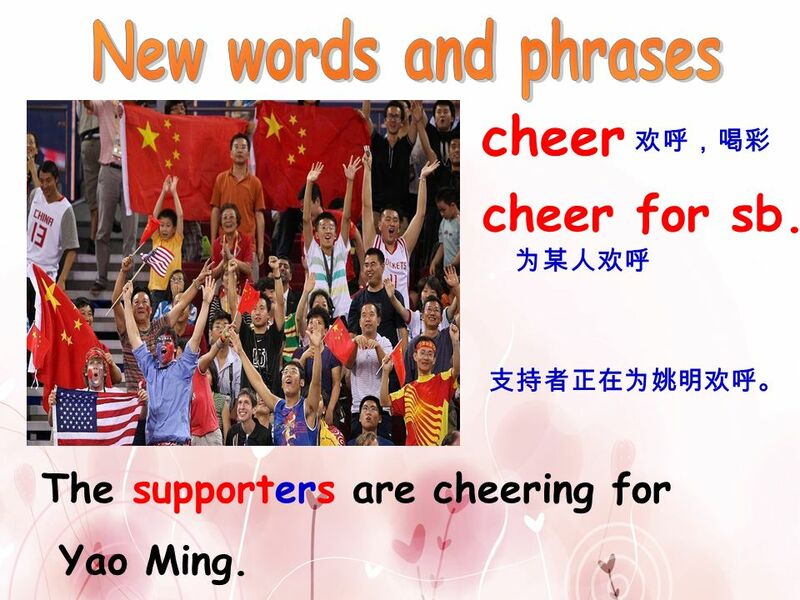 为某人欢呼 支持者正在为姚明欢呼。 The supporters are cheering for Yao Ming. 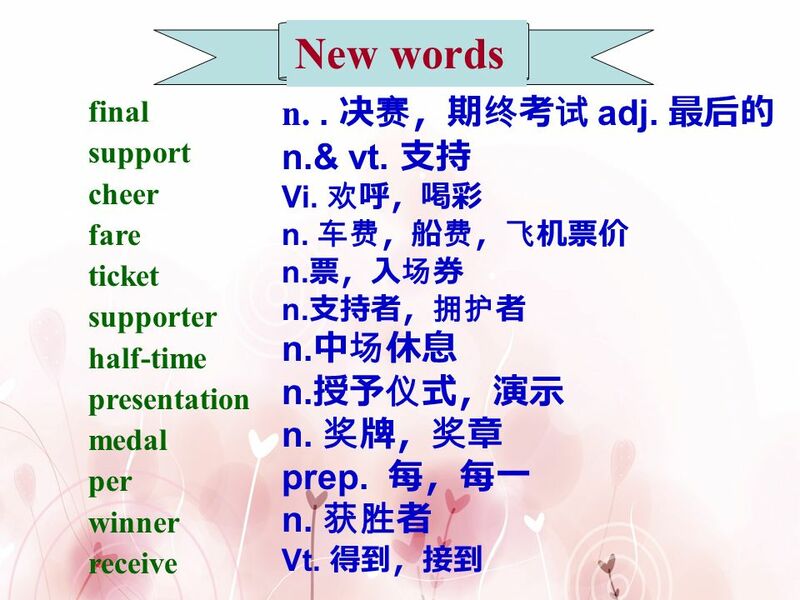 7 half-time New words and phrases They are having a rest at half-time . 中场休息 They are having a rest at half-time . 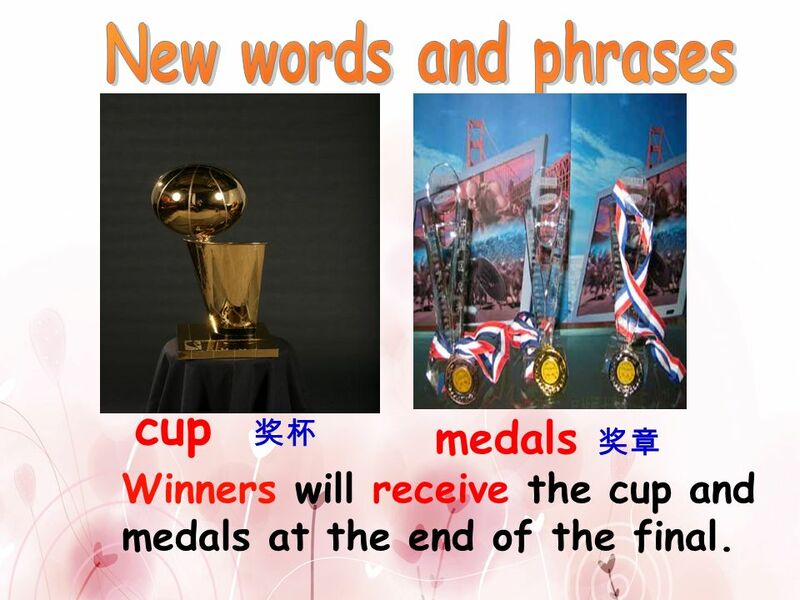 Winners will receive the cup and medals at the end of the final. 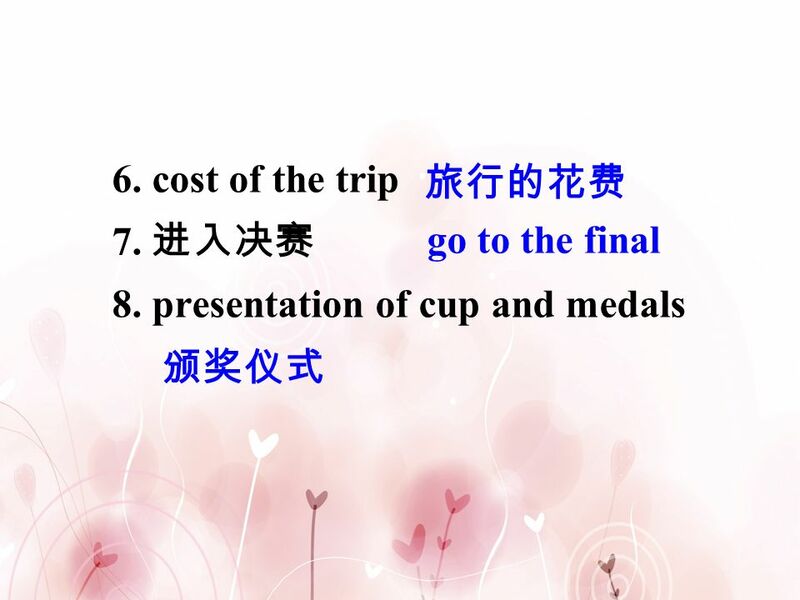 9 It is a presentation of cup and medals. 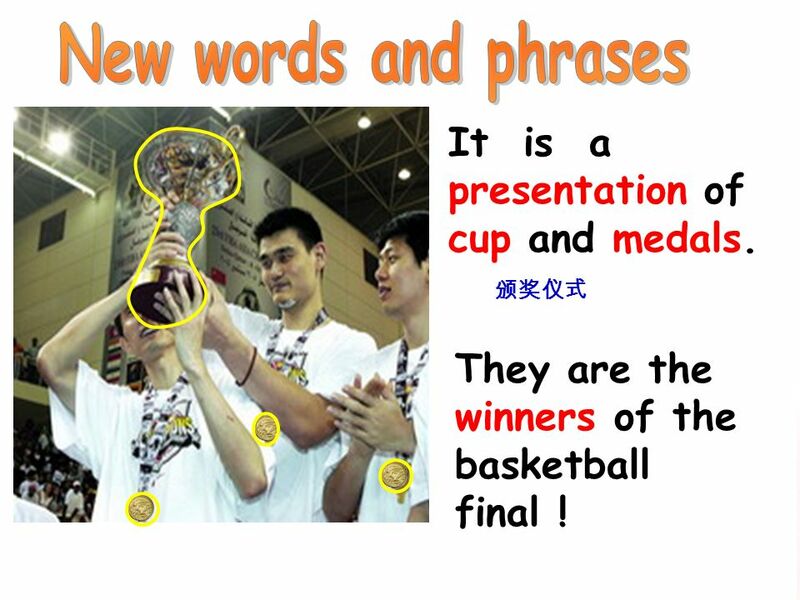 New words and phrases It is a presentation of cup and medals. 颁奖仪式 They are the winners of the basketball final ! 11 The basketball final This is the final of a basketball competition. 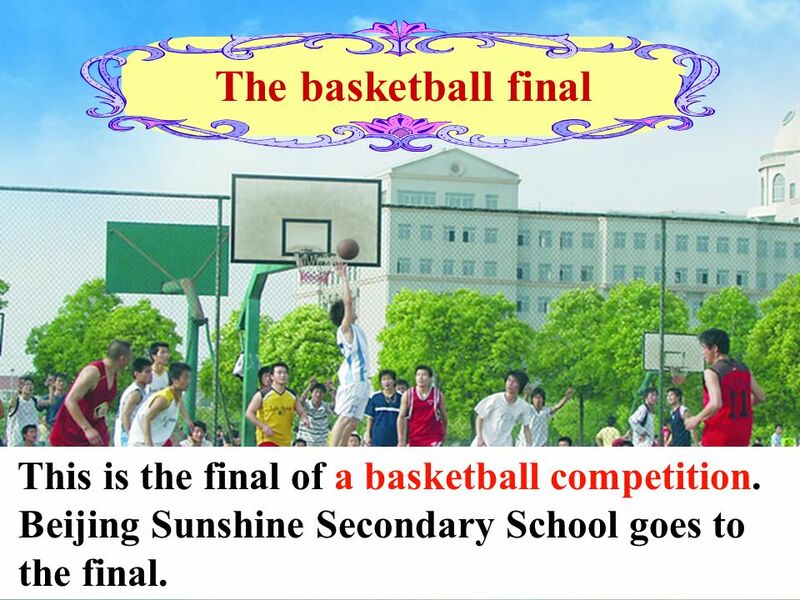 Beijing Sunshine Secondary School goes to the final. 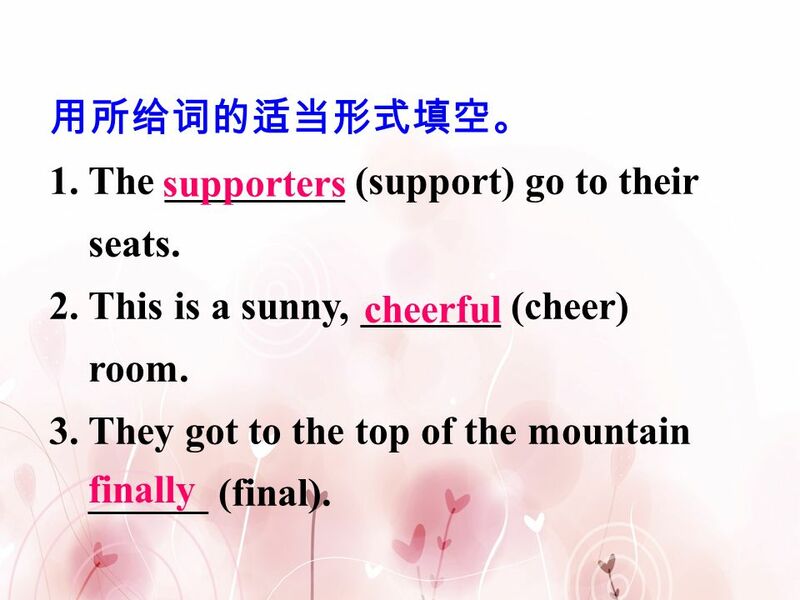 12 Beijing Sunshine Secondary School goes to the final! 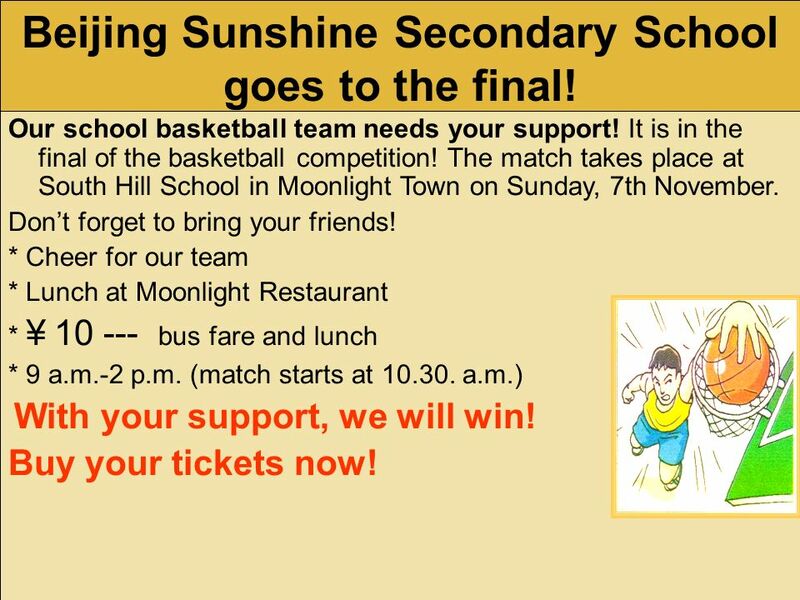 The basketball final Our school basketball team needs your support! 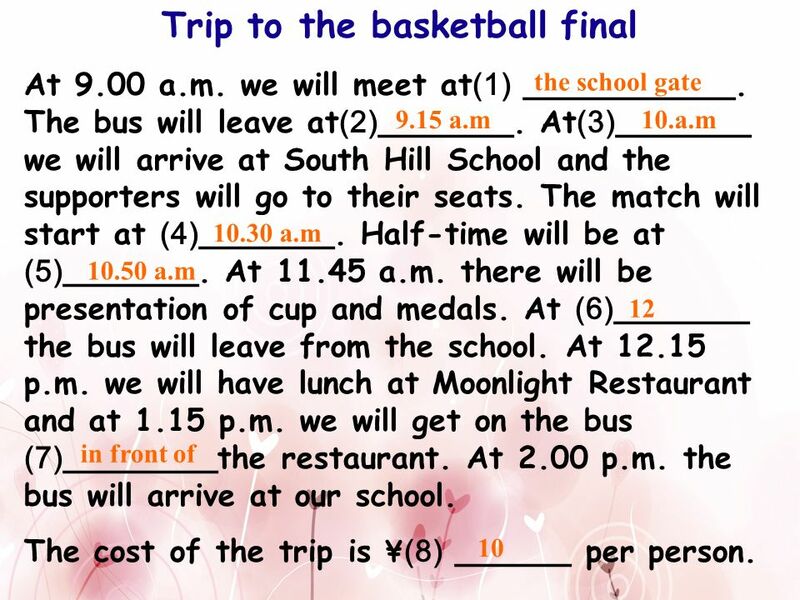 It is in the final of the basketball competition! 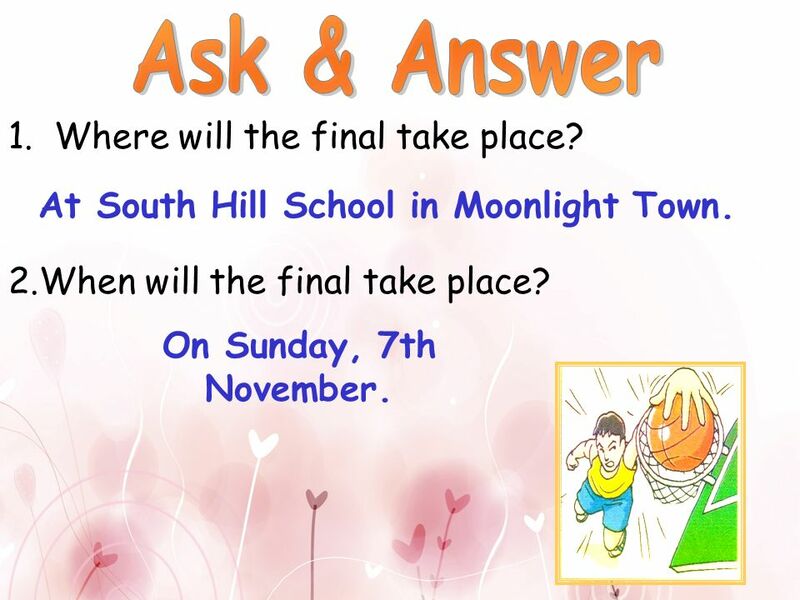 The match takes place at South Hill School in Moonlight Town on Sunday, 7th November. Don’t forget to bring your friends! 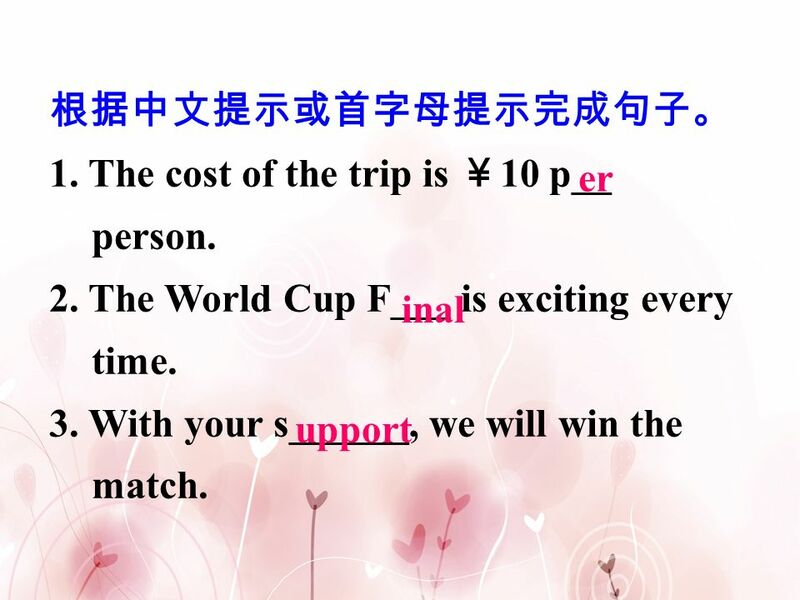 * Cheer for our team * Lunch at Moonlight Restaurant *￥ bus fare and lunch * 9 a.m.-2 p.m. (match starts at a.m.) With your support, we will win! Buy your tickets now! 13 Read the poster 1. Where will the final take place? 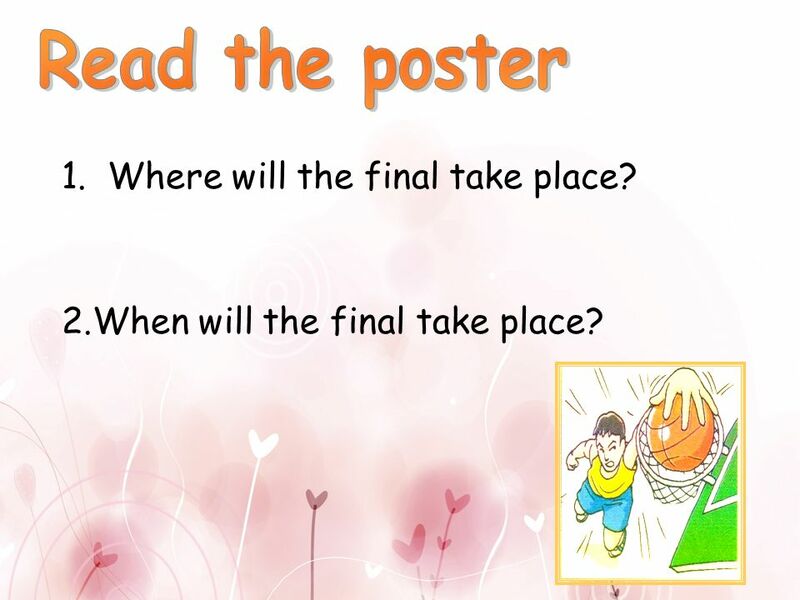 2.When will the final take place? 14 Beijing Sunshine Secondary School goes to the final! 15 At South Hill School in Moonlight Town. Ask & Answer 1. Where will the final take place? 2.When will the final take place? 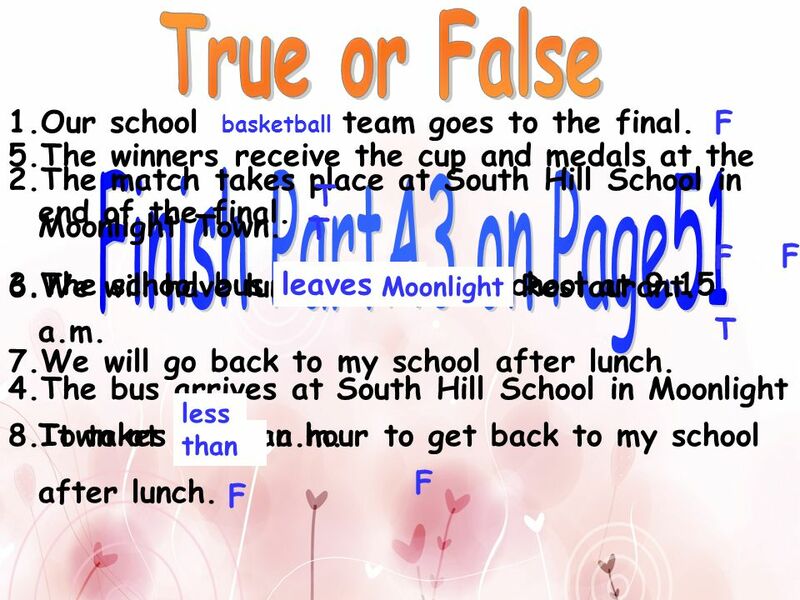 At South Hill School in Moonlight Town. On Sunday, 7th November. 16 Listening 10.30 a.m. The (4) ____________. meet 1.15 p.m. 9 a.m. Have lunch 1.15 p.m. Bus leaves 9 a.m. 12.15p.m. 9.15 a.m. 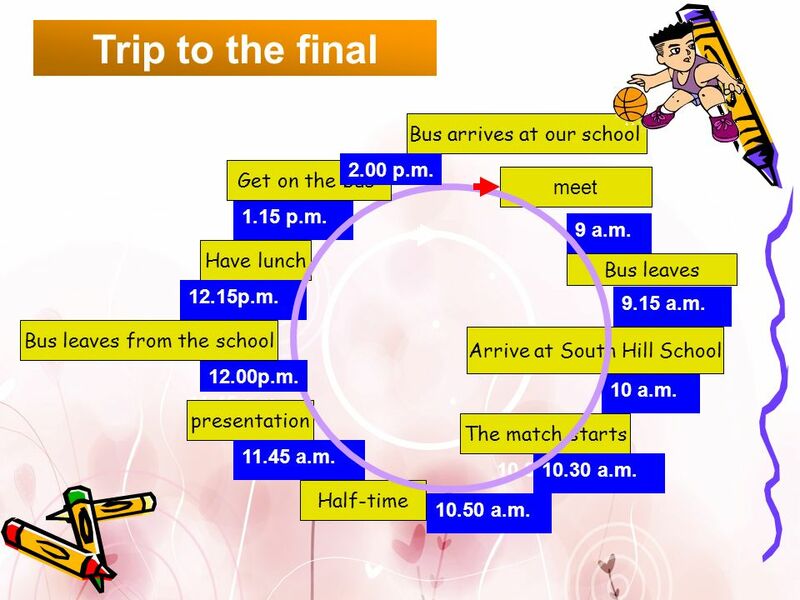 Bus leaves from the school 12 Arrive at South Hill School 9.15 a.m. 12.00p.m. 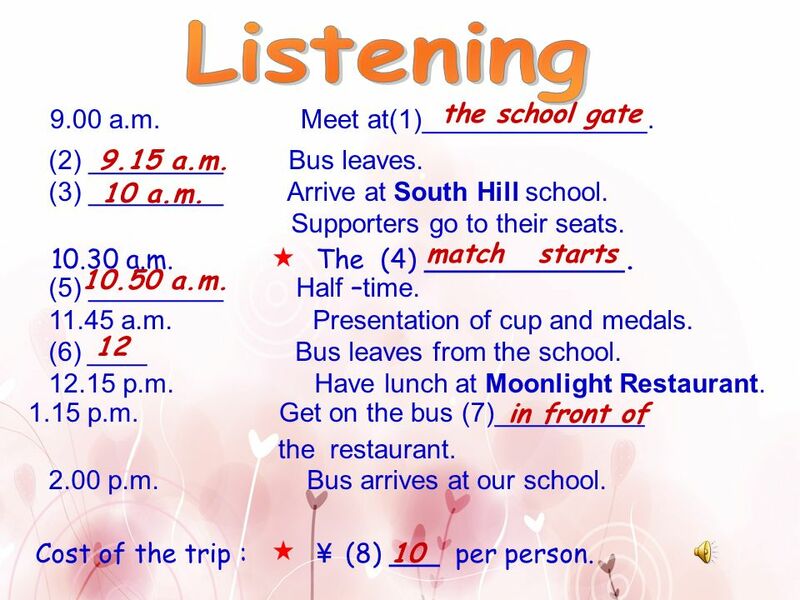 10 a.m. Write down the things that will happen in the blocks according to the time line. Talk about the trip in your group. 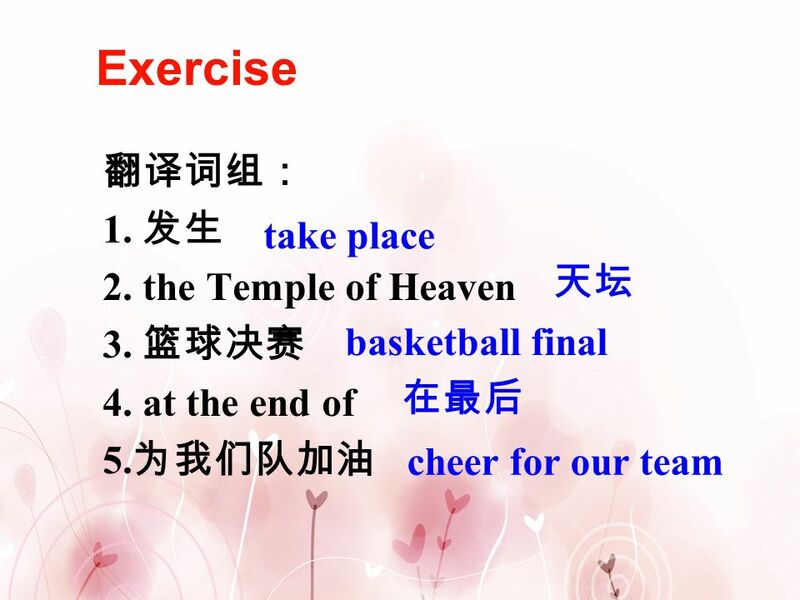 11.45 a.m. presentation The match starts 11.45 a.m. 10.50 a.m. 10.30 a.m. 10.30 a.m. Half-time 10.50 a.m.
28 Speak up Let’s go to the Temple of Heaven and then play hide-and-seek in Beijing Amusement Park. Sure. 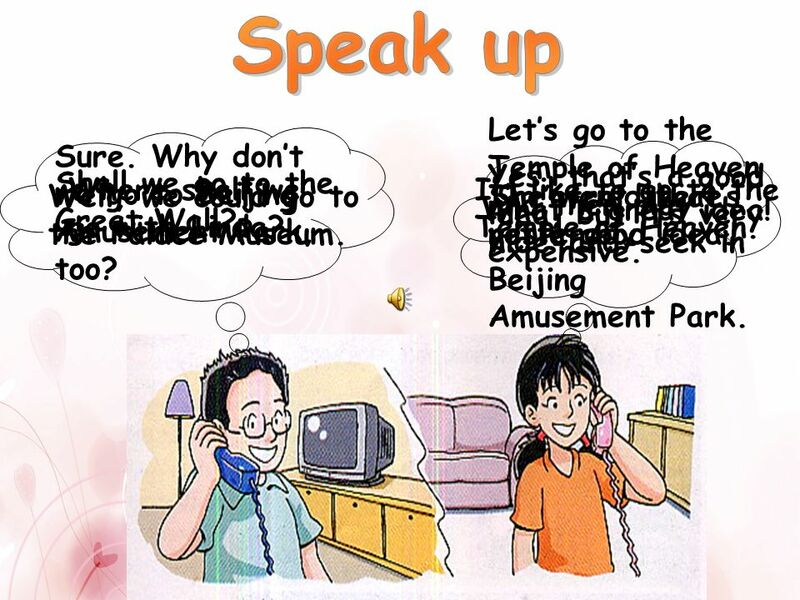 Why don’t we go to Beijing Amusement Park, too? Yes, that’s a good idea, but it’s very expensive. Shall we go to the Great Wall? Where shall we go with Linda? 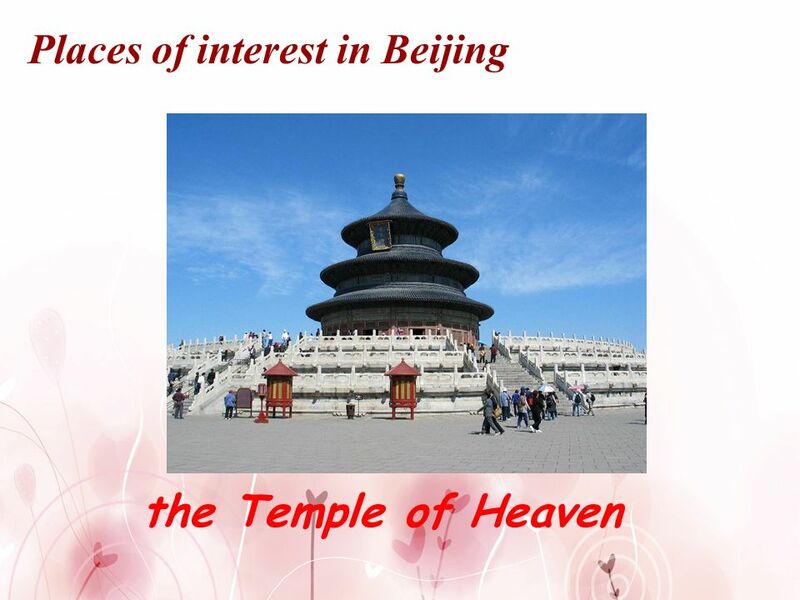 I’d like to go to the Temple of Heaven. Well, we could go to the Palace Museum. She went there yesterday. I’m afraid that’s not a good idea. What a great idea! 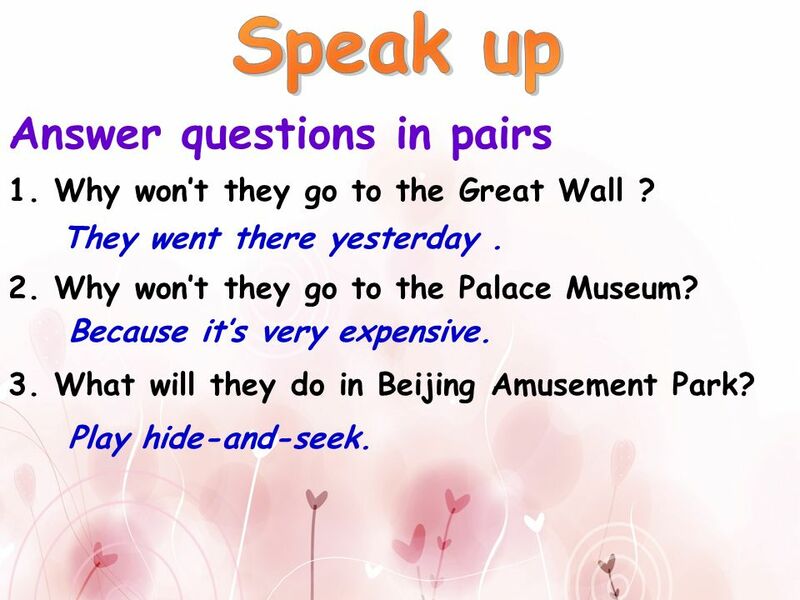 Speak up Answer questions in pairs 1. Why won’t they go to the Great Wall ? 2. Why won’t they go to the Palace Museum? 3. What will they do in Beijing Amusement Park? They went there yesterday . Because it’s very expensive. Play hide-and-seek. Speak up shall we I’d like to Let’s I’m afraid Why don’t we Where _______ go with Linda? 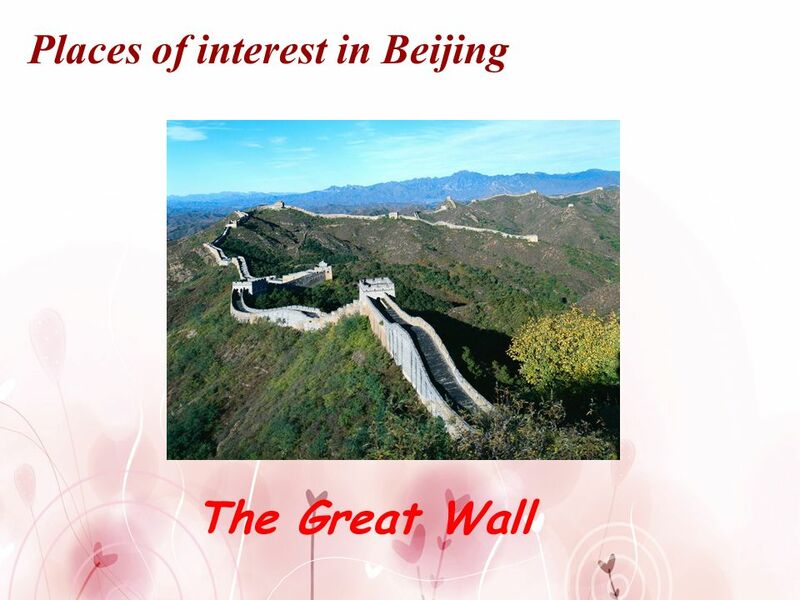 Shall we go to the Great Wall? _________ that’s not a good idea. She went there yesterday. 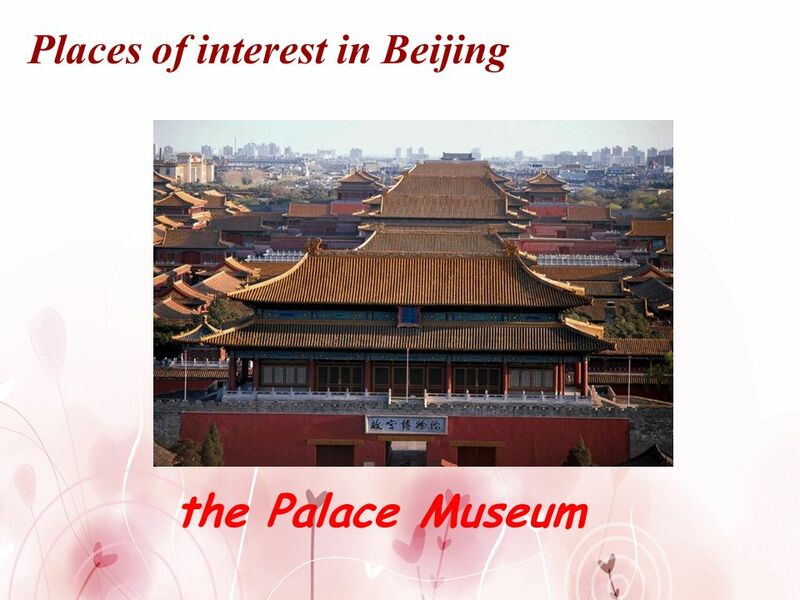 Well, we could go to the Palace Museum. Yes, that’s a good idea, but it’s very expensive. ________ go to the Temple of Heaven. Sure. 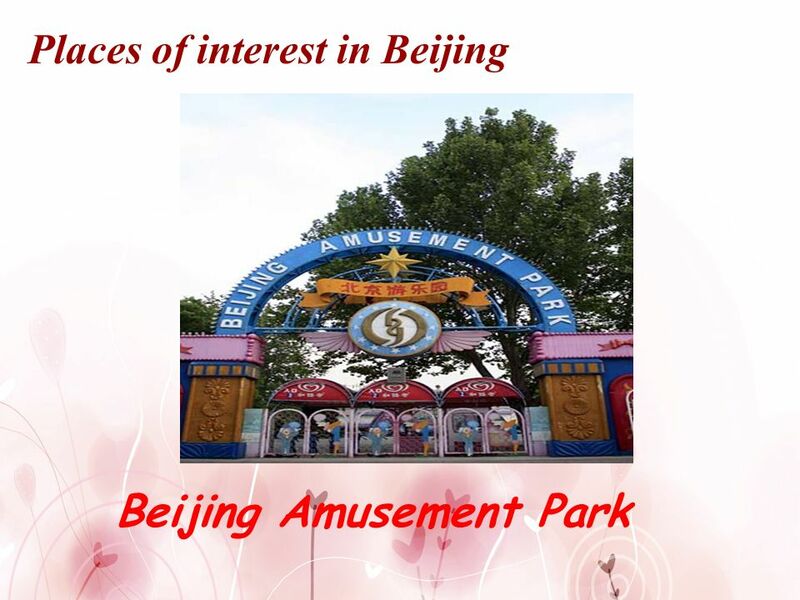 __________ go to the Beijing Amusement Park too? What a great idea! 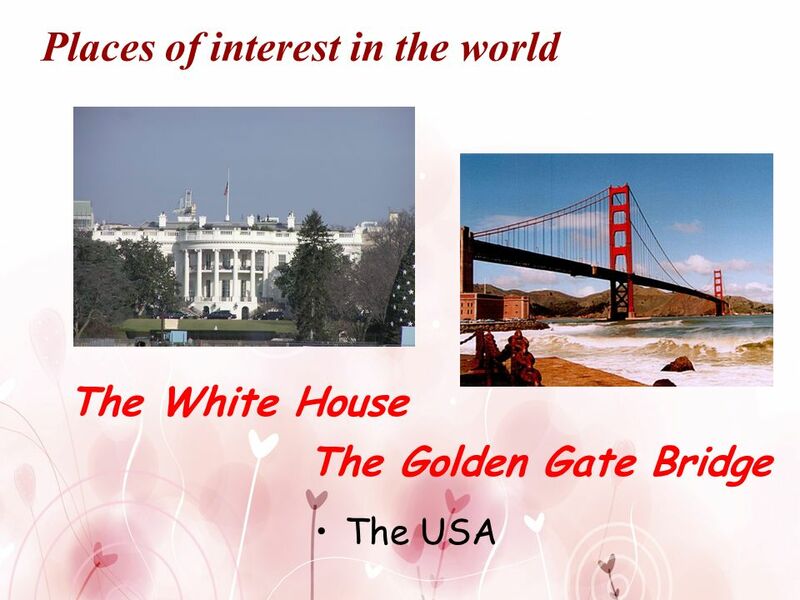 ______ go to the Temple of Heaven and then play hide-and-seek in Beijing Amusement Park. 35 4. Look! 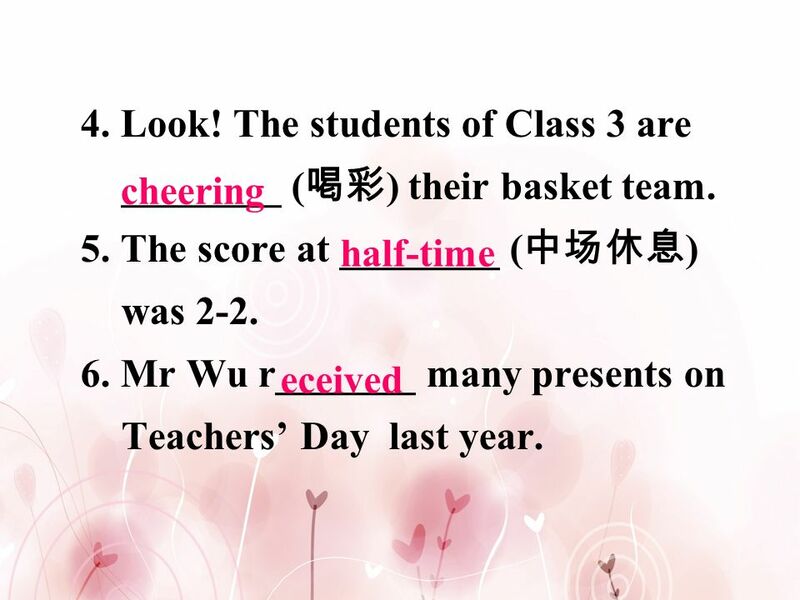 The students of Class 3 are ________ (喝彩) their basket team. 37 4. 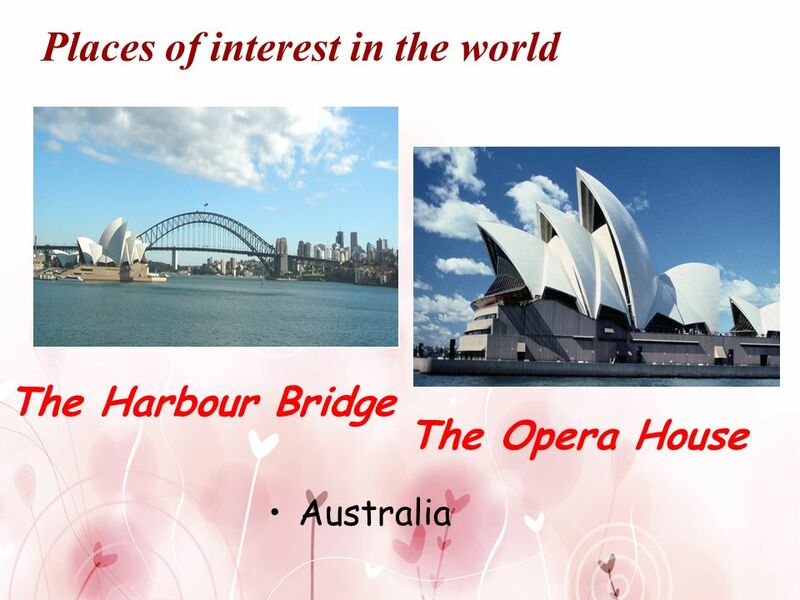 Don’t forget _______ (bring) your English homework here tomorrow. 2. 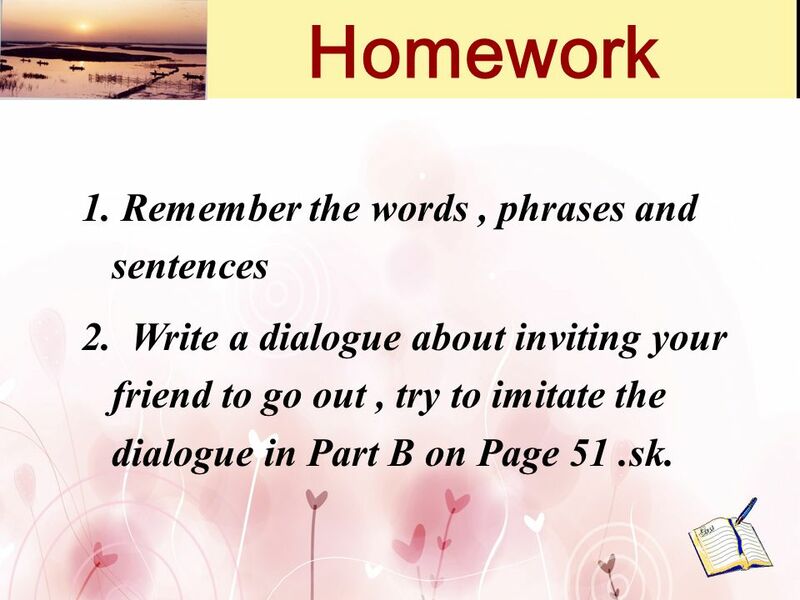 Write a dialogue about inviting your friend to go out , try to imitate the dialogue in Part B on Page 51 .sk. 39 Thank You , Bye ! 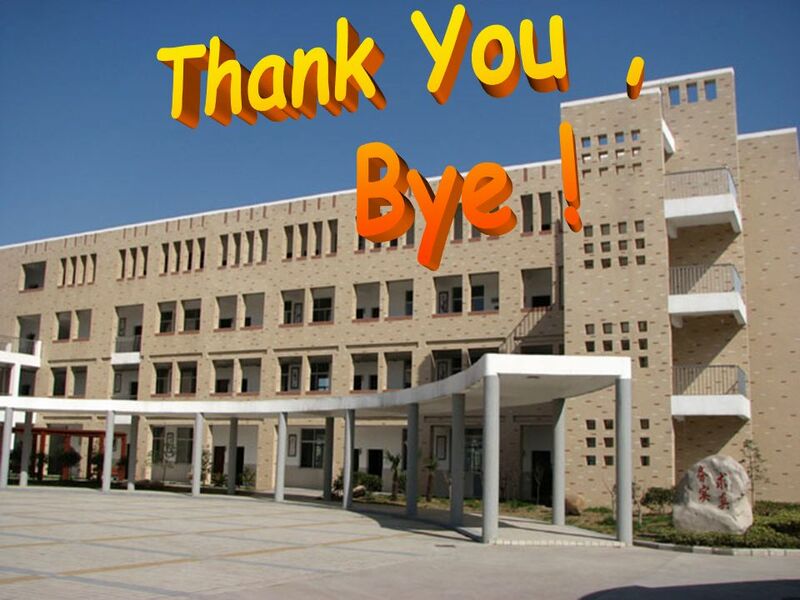 Thank You , Bye ! 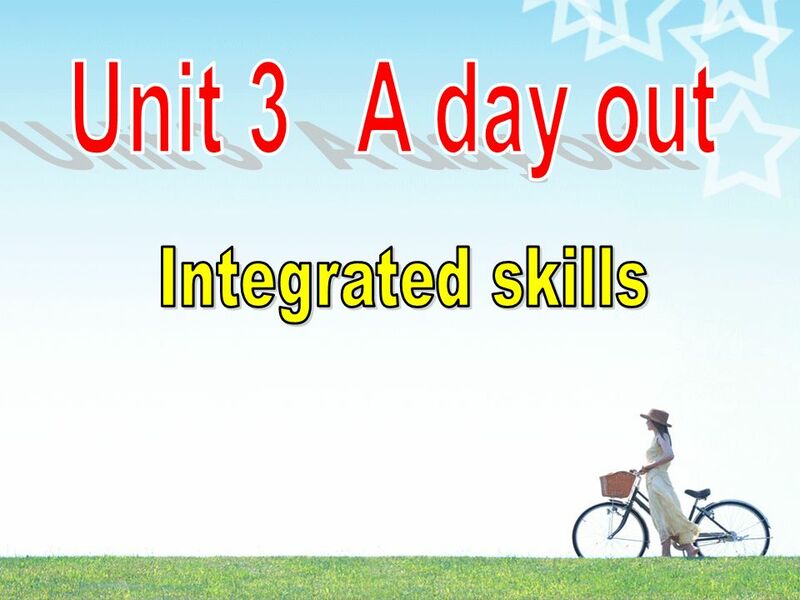 Download ppt "Unit 3 A day out Integrated skills." Unit 2 Travelling Welcome to the unit. 25 1. Today we ______ have real English food. A. going to B. are going to C. are going D. is going 2. We don't have ______ beef on the table. A. some. 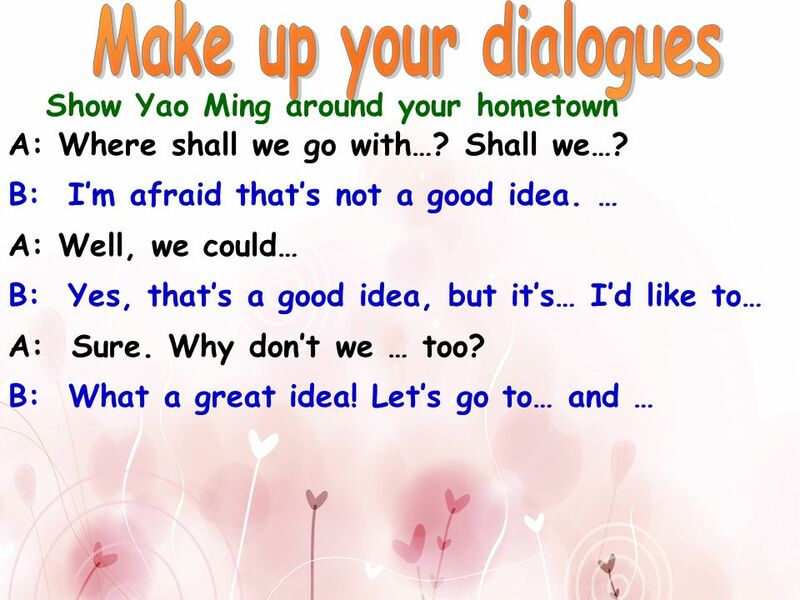 Unit 2 My day Main Task By Pan Xiaojin. 1. (adj. )________ 2. (n.)_________ 3. (n.)___________ 4. (n.)__________ 5. (n.)___________ 6. (adj. )_________ 7. __________ 8. ________________ 9. _________________. Elapsed Time & Determining Start and End Times Mountain-Hill-Rock Strategy By Linda Ewonce. Integrated skills 八中 钱瑛 Unit 3 A day out Wangfujing Street go shopping. 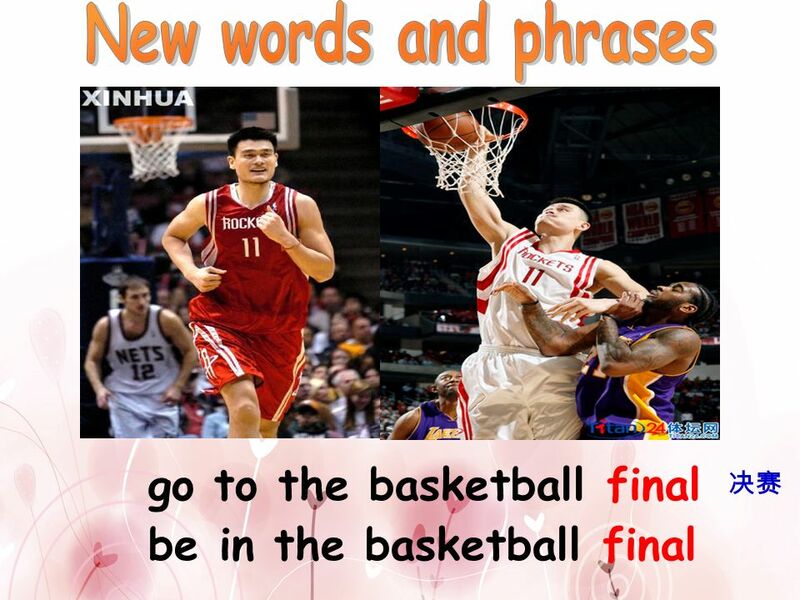 basketball matches Which basketball player is the most famous in China? Yao Ming.